These are dangerously good! You must exert some self-control. 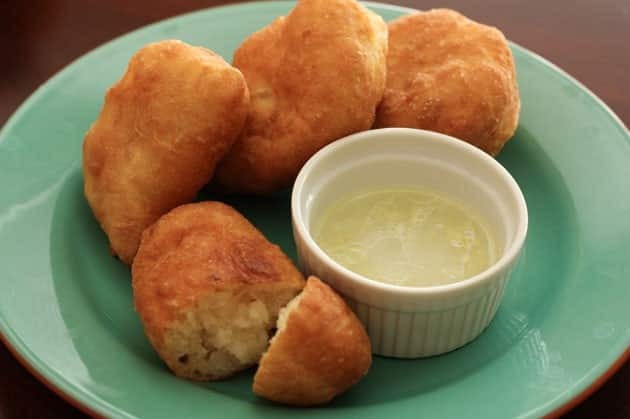 Potato pirojki are one thing, but paired with the garlic dip… Oooh baby! $4-5 for 16 Piroshi's. You can also buy these ready made with Spinach, Potato or Feta Cheese custom made from The Royal Market on Geary Street. Sam, the Owner will make a batch of Giant ones for about $1.50 each. Mash potatoes, then add melted butter. Saute diced onion and 1 tbsp butter until onion is browned. Mix onions into potatoes and let the mix cool to room temp. How to make the Dough: Using bread maker method. Set it to the dough setting and add the ingredients in the following order: Oil, water, 2 cups flour, salt, sugar, 2 cups + 2 tbsp flour*, yeast. *to get an exact flour measurement, use a dry ingredients measuring cup and scrape off the top with the back of a butter knife. Stand Mixer Method: Using a dough hook on speed 2, mix all the ingredients together, let rise 30 min in a warm spot, mix again and then let it rise again in a warm place another 45 min (no warmer than 100˚F or you will kill your yeast) It should be 2 to 2½ times in volume. Put the finished dough onto a well floured cutting board, dust the dough with flour and with well-floured hands, shape it into a large log. It will rise more as you make the piroshki Cut off pieces one at a time about ¾″ thick. Place the piece of dough over your well-floured hand and shape it into a 3″ to 4″ circle using your hands. Do not put flour on the side where you are going to put the potatoes, otherwise the sides won’t seal. Heat oil in a large, deep, heavy-bottomed pan. There should be enough oil to cover the pirojki half-way up the side. Place them in the hot oil (about 330 °F) and fry until deep golden brown on each side. Place on paper towels to cool and enjoy! To make the garlic dipping sauce; just mix all the sauce ingredients together.